We have our very first press from the boys over at SmartShanghai, who gave us a quick review. 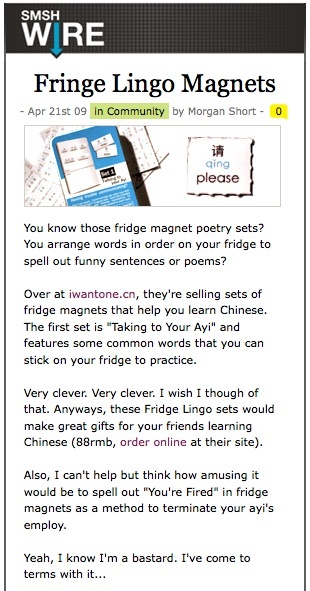 Thanks for the positive feedback guys, and enjoy the Magnets! This entry was posted on Friday, April 24th, 2009 at 11:53 am	and is filed under press. You can follow any responses to this entry through the RSS 2.0 feed. You can leave a response, or trackback from your own site. Been busy on other projects, so this has been moved to the back of the queue.